[email protected], a public K-8 school for children on the autism spectrum and with special needs, had no playground prior to the renovation—just an empty yard. 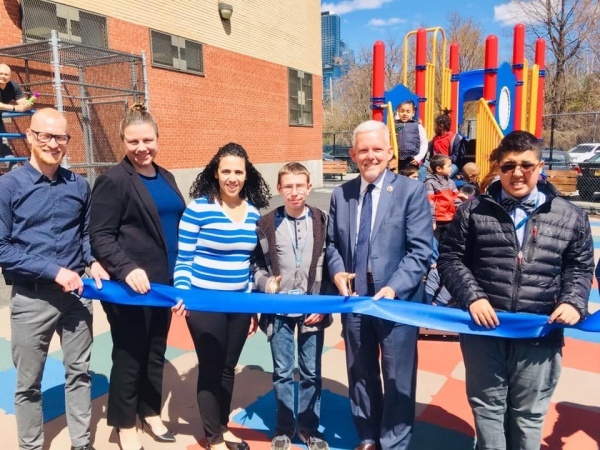 Several teachers brought the idea of an autism-centric playground to the councilmember at one of his 2015 neighborhood assemblies about participatory budgeting, which allows residents to decide how to spend capital funds. From there, the teachers turned the idea into a winning proposal. The project won the most votes in Van Bramer’s 2015-2016 participatory budget, racking up over 1,400 votes. The $250,000 playground is designed for children with motor skill and sensory issues, which are common for individuals with autism. It features “touch and feel areas”, rock climbing, and a slide. PQ4’s Acting Interim Principal Alison Quinlain said that the playground would not only enhance students’ quality of life but their education. “As Mr. Rogers said, ‘Play is often talked about as if it were a relief from serious learning. But for children, play is serious learning. Play is really the work of childhood,” she said. At least it has been built quicker and cheaper than the library. When is that finished ???? Never. 50 Mill. ?? But of course he needs to take credit for this . I’m sure parents had to beg for money for this for years. There he is again Jimmy “Photo-op” Van Bramer, the “Chulo” of Sunnyside.